"We've got two kids with Down syndrome, a three-legged dog, and a pig — all of whom will be freaked out." Among the many moving stories emerging from hurricane-ravaged Texas is one rescue operation that involves a beloved — and unique — pet. 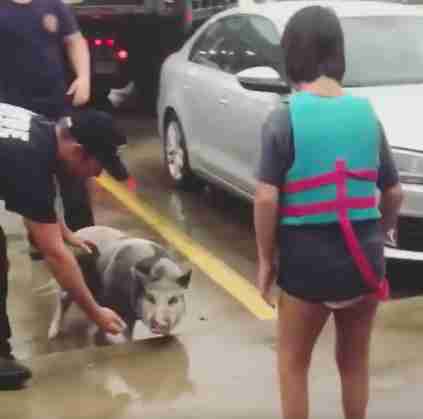 A mother in Houston, stuck in her house with her family as floodwaters were rising, informed a firefighter: "We've got two kids with Down syndrome, a three-legged dog, and a pig — all of whom will be freaked out." "No one anticipated the water would rise as fast and as ferociously as it did," Lisa Eicher wrote in her Instagram post. "When the firefighters arrived, they yelled, 'We have to get out now!'" The family had already relocated their pet pig Penny to the garage, because her pen had started flooding. But now it was time to move the whole family — and that meant Penny, too. "My biggest concern about evacuating was our pig, Penny," Eicher told The Dodo. "A dog is one thing but Penny is another story! I didn't know how it would work. But leaving her behind wasn't an option." The Eicher family had raised Penny since she was just an 8-week-old baby piglet. 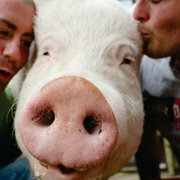 Eicher's daughter, Ace, had been begging a pet pig, so the family brought Penny home one Valentine's Day years ago. She's been an Eicher ever since. "She is a part of our family," Eicher said. So when waters started rising during Hurricane Harvey, Eicher woke up the kids, threw a few valuables in a garbage bag, and evacuated. The firefighters ferried the whole family to a rescue raft. 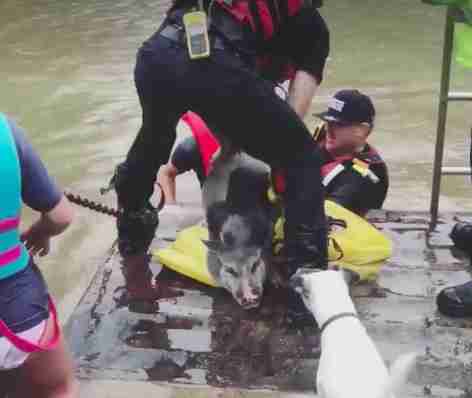 "As they swam Penny the pig out to the truck, one of the firemen said to me, 'You better be getting this on video.' I assured him I was," Eicher wrote. "Comic relief was abundant." As Penny arrived, the family's dog was waiting for her. Safe, the family was dropped off on higher ground at a gas station where they could shelter themselves from the endless rain. "The kids and I sat in the only spot safe from rain in front of the gas station and waited," Eicher wrote. "The attendant came out and brought us all sandwiches. A sweet man insisted I take twenty dollars to buy something for the kids. And a homeless couple brought us blankets. Wanting nothing in return. Countless people stopped to check on us and offer help." And Penny the pig seemed to help lift people's spirits — many people stopped to take a selfie with her. "We don't know what damage will be done to our house, we are worried. But more than anything, we are overwhelmed by the kindness of people. So many of you have offered to help, even offered to open your homes to us. Thank you," she said. The family has since taken shelter at a friend's house until they can return home and assess the damage. Eicher's story obviously resonated with people — the Facebook post has been shared over 16,000 times since it was posted on Monday. "My only regret is that I didn't charge people for selfies with Penny the Pig at the gas station," Eicher joked. 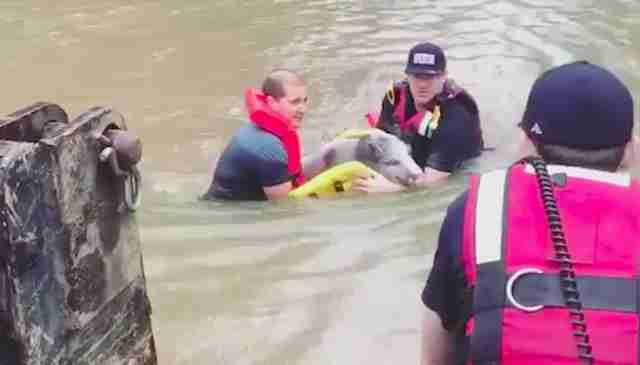 You can help animals impacted by Hurricane Harvey through these tips. You can also help families impacted by donating to the American Red Cross.